Your load factor compares your electric energy use in kilowatt-hours with your peak demand in kilowatts. You can get the kilowatt-hours or kWhfor a given month from your electricity bill. You have to add all loads in your home that might use electricity at the same time to get the peak load in kilowatts or kW. A low load factor means your home has high peaks of electricity use, resulting in inefficient utilization of your electric system and the electric grid. You can increase your load factor by reducing your peak demand. Traditional utility meters measure usage in kilowatt-hours. 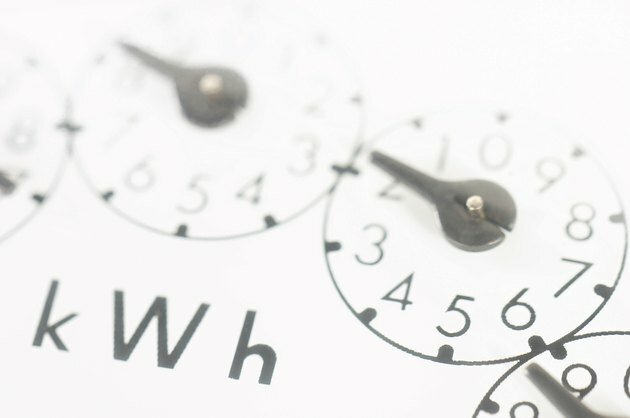 Check your utility bill to find the amount of power in kWh you used in the most recent month. Check old bills to find out how your power usage varies over the year. Draw a table with four columns. Each line will represent a month's bill data. Write the power used for each month in the first column. The second column will be for peak demand, the third column for hours per month and a fourth column for the load factor. Make a list of all electric loads in your home. For lights, check the wattage of the bulbs, typically 40, 60 or 100 watts. For small appliances, find the wattage on the nameplate underneath or on the side of the appliance, typically up to 1,500 watts. For large appliances such as refrigerators, stoves and dryers, find the rated watts on the nameplates near the power supply cord. Stoves and dryers are typically rated several thousand watts; fridges and freezers use several hundred watts. Read the nameplates on your hot water heater, furnace and air conditioning unit to get the ratings for those systems, typically in thousands of watts. Add all loads that are running at particular times of the day. For example, a peak time in summer might be early evening when the air conditioning is on and you are doing the laundry and cooking. A winter peak might be early morning when the furnace comes on, various lights are on, you take a shower and you are making breakfast. Add the loads connected simultaneously during the highest peak for each month. Fill in your estimated peak demands for each month in your table. Calculate the hours for each month by taking the number of days and multiplying by 24. Multiply the number of hours in each month by the peak demand for the month. Divide the kWh of energy use for the month by the result to get the load factor. Multiply by 100 to get the load factor expressed in percent. For example, if your energy use for June is 6,000 kWh and your estimated peak demand is 30 kW, multiply the number of hours in June -- 30 x 24 = 720 -- by the peak demand to get 21,600. Your energy use of 6,000 kWh divided by 21,600 gives a load factor of 0.28 or 28 percent.